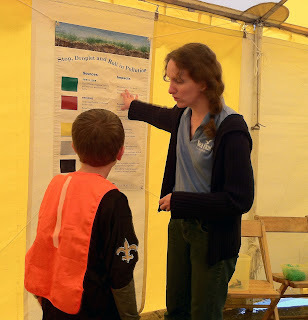 IISG’s Laura Kammin was in West Lafayette, IN last weekend for Purdue University’s annual SpringFest – an opportunity for students and the community to come together and experience just some of the interesting science and outreach work being done by the University and related organizations. Laura was kind enough to share with us some of the great activities and events that were a part of the weekend. “Where else could you find an electric vehicle Grand Prix, puppet making, SimMan, cockroach racing, honey tasting, “bunny fencing”, and a medicine collection event all in one place? Only at Purdue SpringFest! During this year’s SpringFest, IISG partnered with the Purdue College of Pharmacy, Purdue Police Department and West Lafayette Police Department to host a medicine collection event. Despite the rain, 24 people dropped off more than 43 pounds of medicine. Students from the Purdue Chapter of the SnPHA also collected anonymous data as medicines were being turned in, including what was being returned and why participants were returning it. This information will help doctors, pharmacists, and researchers understand why people do not take all of their medicine, and could ultimately lead to a reduction in medicines entering the environment. 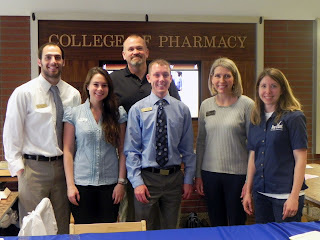 Pictured above are faculty and students from Purdue College of Pharmacy and Officer Moore of the Purdue PD. The students were involved in cataloging the medicines that were brought in as well as giving a survey to participants of the medicine take-back. Thanks to the help of everyone involved, it was a great success and a terrific addition to the SpringFest activities.